"He illuminates life for you, with a lightning flash." 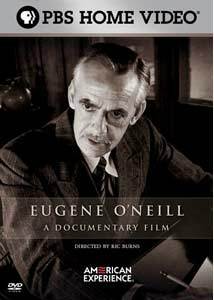 It's not an overstatement to say that American theater began with Eugene O'Neill, but that image of him as a pioneer makes him something of a relic, too. And even the most forgiving O'Neill fan would have to admit that many of his plays are more to be respected than loved—you need to pack a lunch for most of them, and his experimentation in the 1920s and 1930s, with masks and with pretty crude Freudianism, were important developments, but may not be what you have in mind for a Saturday night out on the town. But the truly amazing thing about O'Neill is his late flourish—after all the accolades, after the Nobel Prize, after it seemed that American theater had passed him by, he wrote his most stunning works, Long Day's Journey Into Night and The Iceman Cometh. It almost seems as if, looking back on the life, everything was hurdling forward to climax in those late titanic achievements—and that's certainly the working hypothesis of this reasonably thorough documentary, which serves as a useful primer on the man and his work. Burns' collaborators on the project, O'Neill biographers Arthur and Barbara Gelb, appear on screen for interviews, as do a few theater notables—getting the most screen time, and the most insightful and most passionate, is Tony Kushner, who wrote Angels in America, though John Guare and Lloyd Richards are very good as well. (But where is David Mamet? Sam Shepard? David Rabe? O'Neill's influence is everywhere.) If you've read or seen Long Day's Journey, the facts of the writer's biography seem familiar already—his father squandered his great promise as an actor, as the rightful heir to Edwin Booth, on decades' worth of performances in The Count of Monte Cristo, a cheap melodrama; shortly after Eugene's birth, his mother became a morphine addict; his older brother Jamie lived high and hard, and not very long; and the death of a third brother, two-year-old Edmund, haunted the family to the grave. Burns gives these circumstances a respectful turn, though more of the biographical information is devoted to Carlotta Monterey, ONeill's third wife; in terms of the work, there are good thorough discussions of the experimentations of the '20s, as well as the writer's unfinished nine-play cycle, with the ungainly title Tales of Possessors Self-Dispossessed. There seems not to be a lot of archival material from the man himself; Burns' camera lingers over the same half dozen photographs, as well as a few pages from the writer's handwritten manuscripts. Particularly extraordinary is one of O'Neill's journal entries, from June 1939, when in a sentence he outlines his intentions to write both Long Day's Journey and Iceman. There seems to be a defensiveness in some of the interviewees—perhaps in these days of a Disneyfied Broadway and the socially conscious play seeming to have gone the way of the buggy whip, it's a longing for another time, when the theater was at the center of the American artistic experience; and it does feel like you've got to see O'Neill performed, and performed well, to get a sense of the catharsis at the heart of so much of his work. Still, even if this documentary may end up merely preaching to the choir, it's a strong and respectful effort. Image Transfer Review: Well transferred, with only occasional scratching. Audio Transfer Review: The 5.1 track will leave you a bit more awash in the sounds of O'Neill's beloved sea, but the 2.0 option is perfectly creditable. Extras Review: In a brief interview (07m:52s), Ric Burns is very moving discussing his four-and-a-half hour session with Pacino, at the Provincetown Playhouse, the theater where O'Neill's work was first performed, and he also goes over the challenges of finding things to show—he contrasts this with his feature on Ansel Adams, where another photograph was always welcome. There are some fine things that needed to be excised in the package (37m:31s) of eight deleted scenes, especially an extended discussion of Robards, on working with director José Quintero, and the symphonic aspects of O'Neill's plays. There's more of Plummer as Tyrone, and it's a titanic performance; similarly, Pacino discusses Hughie, one of O'Neill's last one-act plays, which the actor appeared in recently in New York. The theme running through all these interviews is the necessity of the actors to commit absolutely to the words and the work; if you hold back, you're left with nothing but cheap melodrama. A fiery and passionate look at America's first great playwright, with a handful of cameo performances from some great actors that suggest that the flames of live theater may have dimmed in recent years, but cannot be extinguished.